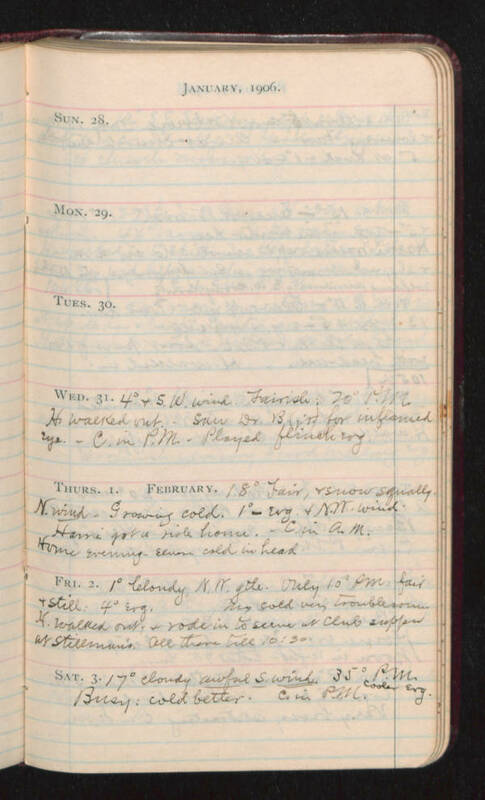 January 1906 Wed. 31. 4° & S.W. wind Fairish. 20° S.W. H. walked out. Saw Dr. Byrd for inflamed eye - C. in P.M. Played flinching Thurs. 1. February 18° Fair, & snow squally N. wind - Growing cold. 1° - Evg & N.W. wind. Harri got a ride home. C in A.M. Home Evening - Elven cold in head Fri. 2. 1° Cloudy, N.W. gtle. Only 10° pm fair & still. 4° Evg. My cold very troublesome. H. Walked out - rode in to serve at Club supper at Stillman's. All (illegible) till 10:30. Sat. 3. 17° cloudy awful S. wind. 35° P.M. Busy: Cold better. C. in P.M.